Our records indicate that we have spoken to you in regards to your concerns. For further questions please contact us at customersupport@empiretoday.com. 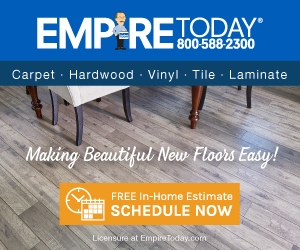 I contracted with Empire Today to install vinyl flooring throughout my house which included 2 beds 2 bath and the kitchen. First of all they cancelled on me the first day and then they finally showed up the next day around noon and only one person spoke English. They all left except the two young men who couldn't speak English and were not at all professional installers. I think they were the sons of the lead worker and he spoke very little English. They did a *** poor job of laying the vinyl and It took them 12 hours in which to do so. I have requested, and pleaded with them to come back out to fix the mess that they made of my vinyl in the kitchen, it has a pattern and its laid crooked, it looks terrible. There are no transition strips from room to room and my appliances were not put back correctly, so now I can't open my dishwasher door all the way. I am still fighting with them and I have now contacted the District Attorney's office for help. I tell everyone, do not use these people, they are a total scam, just to get your money. I didn't like: Installers not knowledgeable. Review #856034 is a subjective opinion of User856034. Thank you for bringing your concerns to our attention. We are disappointed to hear about your dissatisfaction with Empire, and would like to learn more. Unfortunately, we are unable to verify your Empire customer information. Please contact customersupport@empiretoday.com at your earliest convenience.